You're name is K T. and you're an empowered teenage girl with skills. The adventure begins when your bratty little brother, Simon, steals your journal. You must catch him before he cracks your code and reads it to his lame friends. Failure is not an option! This theft presents a clear and present danger to your reputation. Your journal holds your deepest secrets - really personal stuff that only you know. Climb inside your awesome Floating Bubble Jumper and navigate your way to your journal being held in Simon's Electronic Treasure Vault before time runs out! You have 90 seconds per round to reach his evil device and shut it down to save your own skin. Press the space bar as needed to float up and the left and right arrow keys to steer. Your score is based on how quickly you reach your journal. You also get extra points for collecting objects along the way • 10 points for coins, SO - 200 points for cookies, 500 -1,000 for precious diamonds and gems. You only have three Floating Bubble Jumpers, so keep a keen eye out for trouble along your journey. Boxes, pipes and statues will block your path. Sharp spikes and Simon's gross traps will zap your Bubble Power, but you can collect bottles of bubble bath for a quick recharge. And to make things worse, Simon's creepy little buddies are out to annoy you. You will need all your brains and abilities to catch your brother the rat. Good luck! If you want to play KT's Impossi-Bubble Adventures games online you have come to the right place! 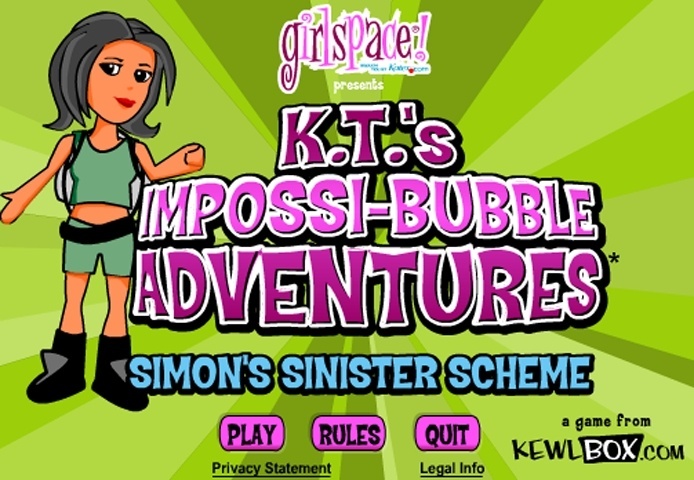 GamesLoon adds new KT's Impossi-Bubble Adventures games every week. This is your game portal where you can find the biggest collection of free KT's Impossi-Bubble Adventures games online. Do not forget to rate our KT's Impossi-Bubble Adventures free online games while playing!